In my humble opinion it is not related to a specific indicator but to a group of indicators, and the most important is to choose the correct ones and how to set them all together to find an edge. and Donchian Channel of 13 bars. A bar can trigger a signal, only if it is making equal or higher high for a short, so we check that the high of bar must be touching the Donchian Channel. If price continues against our entry we don't get a fill, just another bar with better entry, until the envelope touches the trendline again and the trade is discarded. 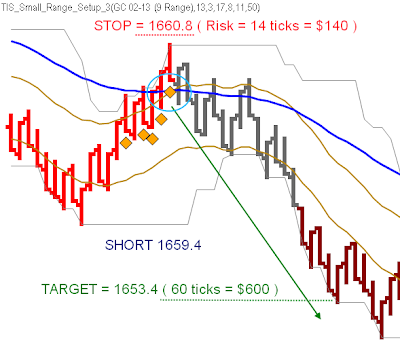 The stop must be placed 2 ticks above the high of the entry bar ; 1660.8 so we are risking 1.4 points = $140 per contract. 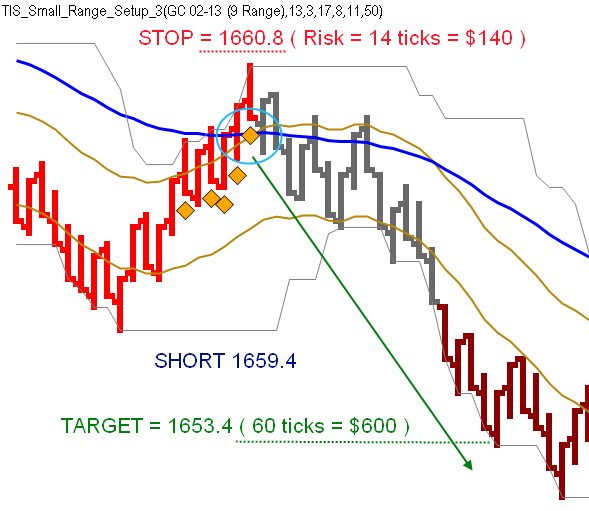 We usually should go for 1.5 to 2 times the range of the chart as first target ( 15 to 20 ticks ). On this example the move was enough to get 6 points ( $600 ) per contract. On instruments like gold or crude oil we should always take into account the option of using trailing stops, because these markets offer great potential. I found this really easy to use on any market. An excellent indicator to trade gold or crude oil.